Efosa is the founder of PT Haven and currently works as a physical therapist in Chicago, IL for ATI Physical Therapy. 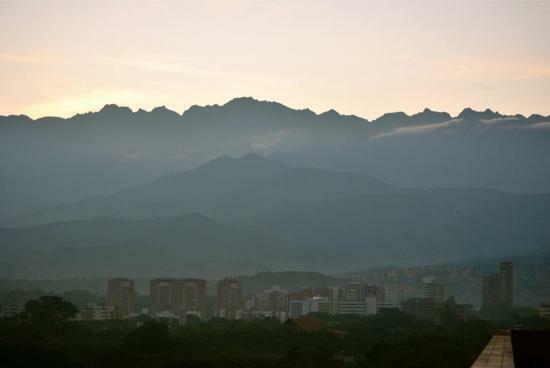 From November 12th through November 19th 2011 I was a participant on a mission trip to Cali, Colombia led by a group called SpineHope. SpineHope was founded by Dr. Tony Rinella, Dr. Matthew Geck, and Ethan Lauer, CNIM. 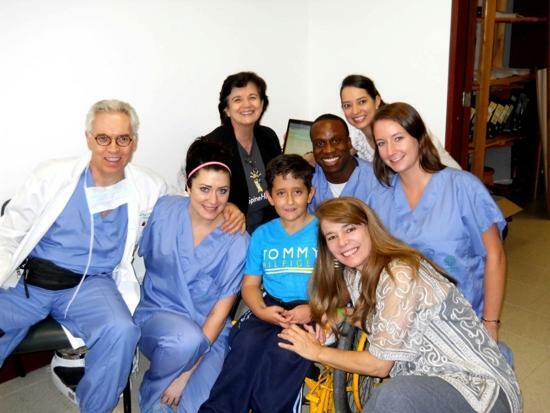 The group has been making semiannual trips to Cali since 2001, and their purpose is to evaluate and perform surgeries on children with severe spinal conditions, while educating and working with other health professionals on site. Dr. Rinella and executive director Beth Felker led this trip and the group consisted of two other surgeons, 3 neurophysiologic op monitors, two medical equipment representatives, and two physical therapists representing ATI Physical Therapy, Nate Whitney and myself Efosa Guobadia. We knew for a month that there would be an opportunity to be involved in this trip, yet it was made official only one week before take off! That certainly got the adventure started off on the right foot. My colleague Nate and I made a pact to dive into the experience and to maximize it by learning all that we could from the patients that we would interact with, from our counterpart health professionals in Colombia that we would meet and from the other professionals with whom we would be travelling. The below piece is a glimpse of the journey that we made and some of the lessons and stories that were had along the way. In light of my quest to improve my grasp of the Spanish language, I say to you: ‘Muchas Gracias.’ I hope that you enjoy the story as much as we enjoyed living it. Today was our first official day of the Colombian trip. Every time I fly I am reminded of why I love travelling. It is the coming and goings of people. A place and time to stop and reflect on the place that you are leaving and prepare for the place you are going to. After making sure I have my particulars to travel, I head to the airport to begin what I know will be a very fulfilling trip. After one stop in Tampa Bay, I meet the rest of the team in Miami and we all hop on the same flight to our final destination of Cali, Colombia in South America. Members of the rest of the team include physicians: Tony Rinella, Christopher Bergin, and Sassan Keshavarzi; SpineHope executive director Beth Felker; neurophysiologic monitors: Jade Morris, Bridget Mortell, Jamie Schultz; medical equipment representatives Jessica Manning, and Michael O’Sadnick; and physical therapists Nate Whitney and myself Efosa Guobadia. With the jokes and the early easy conversation I can tell that the upcoming trip is going to be a good time and that each person will bring a dynamic touch. As we land in Colombia we are met by a very special lady, Margarita Lenis. Margarita is the Executive Director for the Fundacion Casa de Colombia and her energy was palpable right away. We stop by the hospital to drop off equipment and then we go to our lodging place for the night. We spend a few hours at night putting together goodie bags consisting of toys and treats to give to the children that we will be seeing tomorrow. More stories and laughs are shared as day 1 comes to an end. Tomorrow we head to Fundacion valle del Lili hospital. We spend our first day in the hospital holding clinic. Around forty patients came in to be seen and they are either a potential candidate for surgery or they are patients who are returning for a follow up after having had surgery performed from an earlier trip. The whole process was very special. As the surgeons took the lead evaluating the patients both new and returning, the whole team spent time observing and discussing each patient’s presentation and learning from each other as everyone had a different perspective. The physicians were plotting the specific procedure, the equipment reps recommending the specific equipment, the PT’s contemplating the patient’s gait, posture, mechanics and analyzing what their post operative rehabilitation schedule may look like. It was interdisciplinary at its best. Not just different disciplines in the same room, but different disciplines working together to figure out what is best for the patient. You could tell that the kids and their families sensed it as well. It was an ideal health care presentation and one that is not always wholly reproducible, but one that should be studied and simulated where possible. Communication and teamwork leads to success. What makes a trip like this simultaneously challenging and special is that the children that are brought in to the Spine Hope mission group are those that have exhausted all other medical resources and avenues in their country and are coming here because their situation ranges from mod to max in severity. Some conditions included: spina bifida, morquio syndrome, meningocele, limb amputations, and extreme scoliotic angles among others. I had previously never had experience with these conditions in such severity. Yet with all of that said, it is not the surgeries that most stick out to me from that day. What I will never forget is the strength that I saw in every child’s eyes. It was the strength and innocence of the young who have faced adversity from very early on. And by them just being there, they were displaying a willingness to press and fight on. Those kids redefined what I formerly thought the word tough represented. Their strength and their capacity to love and be loved was inspiring as you saw them interact with us strangers that they never met, and as you saw them rely and be encouraged by their family, the people who never leave their side. And from the parents you sensed them hoping for the best future that their child can have, while appreciating that they were together and alive today. So many of the patients that were returning for follow up that had been performed on from prior trips were doing wonderful. Everyone shared laughs, and hugs, and tears and gifts. Being here for the first time I was able to get a glimpse of the changes from their pre-op presentation to their current form from pictures and x-rays and it was great to see the changes both physical and emotional in each child. One touching story of the day for me revolved around a young girl with neuromuscular scoliosis via cerebral palsy that elicited high tone in an extensor pattern. After evaluating this young girl it was deemed that at this time it would be inappropriate and unsafe to perform surgery. She was largely unresponsive; she had too small of a frame and cranium; and at this time her curve was not progressing. Only her mother was present with her, and when she was notified of the decision, the tears flowed silently down her face chasing one after the other. I would imagine that these are the tougher moments for the physicians that ultimately make these decisions and perform these surgeries. It was certainly touching for me. You could see the mixture of pain, love, anguish and a longing and searching forhope on the mothers face. It was a look that transcends race, culture and time. It was the look of a parent wanting their child to have the best life that they can. As the mother was leaving, a form of tacit communication formed between Beth, Nate and I and we promptly followed the mother out into the hallway. We talked with her of things that she could do in the meantime such as passive stretching, efficient positioning and functional activities. We then utilized what I find to be one of the most effective tools that I have. We hugged her. We urged her to continue to be strong. Deep down, I knew that I would never forget this girl and her mother. I would always be hoping for the best for them. The next two days were spent mainly in the operating room as final decisions had been made on whom surgery would be performed on that week. Clinic time was interspersed in between as returning patients still came back for follow ups. The surgeons were amazing inside of the operating room and it was truly a pleasure to see them work alongside the surgeons from Colombia. Not only were they performing, they were leading, directing, and educating as well. Their process and procedure as they worked their craft in the operating room gave me a good perspective of what they do and how they do it. It was enlightening to see these patients pre-op and now during the operation, and I constantly found myself contemplating the plan of care that I would utilize if I were to see this patient in my clinic after surgery. It was also great to see and feel the buzz that happens in the operating room as the surgeons, medical equipment representatives and neurophysiologic monitors all worked in unison to make sure that all things were going smoothly. I was struck by how unfamiliar I was with operating room process and how unfamiliar some physicians may be with the day to day rehab process. I tucked this thought in my back pocket with plans on making it one of my goals as a health professional to be part of the push that works to increase awareness, communication and appreciation across the spectrum. When we do that the patient wins. When we do that, miracles happen. We also spent time these two days in the rehab center with the physiotherapists of the hospital. We observed as they treated their patients and spent time asking various questions to gauge the similarities and differences of the profession and health care overall between the two countries. Our questions led us to dedicated, caring and skilled therapists who were eager to be the best that they could be. While in the hospital they were given the flexibility of multidimensional roles that utilized them across the spectrum of rehab and across all ages. Their system seemed to limit them as it appeared to be normal routine to at times see 5- 6 patients within cubicle rooms separated by walls at the side and a curtain at the end. They expressed that this prevented them from developing or maximizing some of their manual skills. I am happy to say that via our discussion we gained good insight on their systems and style and we shared some of ours. Although there were strong differences, we found that we had more in common that we had apart. We found that we universally saw rehab and the promotion of an efficient musculoskeletal system as a premier way to return our patients to a high quality of life. The last few days I have been waking up with smiles. At first I think it is because the weather is so nice outside which is in contrast to the current town I live in Chicago, IL. Yet I know it is a reflection of the smiles that I have been seeing all week. Between the children and their families, and the people we have been working with in the hospital all week, there is a strong sense of unity and purpose. We start the day again in the operating room. Seeing more of the children that we first met on Sunday being performed on that table brings a lot if it together and reveals this ‘path of health’ that is not always seen. In the afternoon we complete the ‘path’ as we all go on rounds to see the patients that were performed on that day or earlier in the week. They and their families are presented with SpineHope teddy bears as we spend time with them in their hospital room. Smiles and cries are abundant as we pass from one room to another and the whole while I am filled with a sense of gratitude that I am a part of this mission and what it represents. I never stopped smiling. Today is marking our last day that we will be in the hospital this trip. Nate and I spend most of our time with the rehabilitation department and with their therapists. We gave a presentation and had lab time to practice the things that we shared. One topic was on Proprioceptive Neuromuscular Facilitation (PNF) techniques and of its application at the lower extremity. We discussed that how with active movement across multiple planes accompanied with manual cues and manual resistance you can facilitate improved movement and function by increasing length and strength of the tissue. We also discussed mobilizations for the acromioclavicular joint, sternoclavicular joint, glenohumeral joint, and the functional scapula-thoracic joint. I finished by sharing and discussing the theme that drives me as a physical therapist: The concept of using our Hands and Words for healing. We use our hands for manual therapy, cues and resistance. We get to use our words to motivate, educate, and for active listening. It sometimes feels like a few jobs in one, yet that is what makes the profession of physical therapy so special. That is a theme that is universal. We presented ATI t-shirts to the therapist there, we took pictures and both sides expressed gratitude as the day was wrapping up. Physical therapy really is a haven that people from all over the world can share in together. Hands and Words. 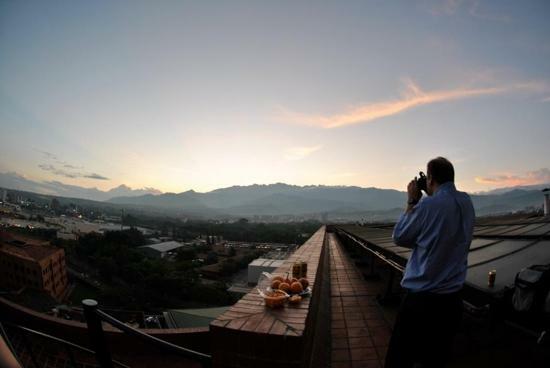 Today was our last full day In Colombia, and it was mainly a day of leisure, yet it was a very special one. We took a bus tour through downtown Colombia to see a few of the sights. It is a great ride as I continue to be fascinated by Cali, and I know that this is a place that I want to return to in the future. We stop for lunch in a beautiful apartment in the city. While taking in a wonderful view from the balcony, we all have a chance to finally catch up about the past week as we enjoy a delicious lunch accompanied with refreshing sangria. While eating, Sassan, one of the physicians, asked me the natural question that arises during a trip of this nature: ‘Efosa what does a trip like this mean to you?’ I began to talk about service, and doing in your heart what feels right and true, and being part of the ripple of good waves that happen everyday across the world to combat the bad that we are too often reminded of. Yet even as I was speaking I knew that although it was all true to me, it wasn’t enough or it wasn’t the whole truth. My scope was limited by being in the present. Therefore I had no idea how it would affect the future which holds just us much of the truth as the past and the now. And I knew that if I was being honest with myself I would know ‘what a trip like this meant to me’ as a lived my life from then on as I encountered various situations both high and low. I knew that if I could remember the strength and smiles of even a few of those kids that I would be okay. The message that I was taking home is that extraordinary things are possible if we are willing to come together and do the ordinary things with all of our heart. That’s what SpineHope and other mission trips really embrace at their true foundation and are what they will always be about. It is about helping those who may not in their current situation have the means to help themselves. It reminds us that we can make a difference by using our hands and our words. We finished the day at Margarita’s villa house in the Andes Mountains. It was so high up that we were above the clouds. The higher we drove while approaching her house the more I believed in the possibilities of our profession of Physical Therapy and its place in the health arena. The height reminded me of the Vision that we have set. The physical therapy profession is driven by professionals who are ‘guided by integrity, life-long learning, and a commitment to comprehensive and accessible health programs for all people’ as noted by Vision 2020. The people that I was with reminded me of all that is possible when health professionals come together to be the best for the patients and people that we see. Each profession should always remember that it is not always about what we can do: it is about what we can do together. En las nubes fui inspirado a la esperanza. In the clouds I was inspired to Hope. I truly hope that you enjoyed reading about this experience. I want to send a special thanks to SpineHope for inviting us on this trip. I had many wonderful conversations with Dr. Tony Rinella and therapist Nate Whitney on ways that physical therapists can really make a difference in this world through mission trips and other avenues. With our hands and words anything is possible. Email us at contribute@pthaven.com if you want to share a story or a blog of one of your experiences on a mission trip. Comment below or email me at efosa@pthaven.com to share your thoughts on some of the above themes. Thanks very much for reading this piece. Click on SpineHope for more information on their group. Click on a Center for Global Initiatives for more great information on mission trips around the world. Here are photos of the Spine Hope trip and the great children and families that we met.